1. In a large pot, heat the oil over medium heat and add the onions (chopped up), garlic and ginger until the onion is translucent, a couple minutes. 2. Add the tomato paste, all spices and saute for another few minutes. 3. Add the vegetable broth, tomatoes and lentils. Cover and bring to a boil, then simmer on low heat for 20-30 minutes, until the lentils are very tender. Season with salt and pepper. 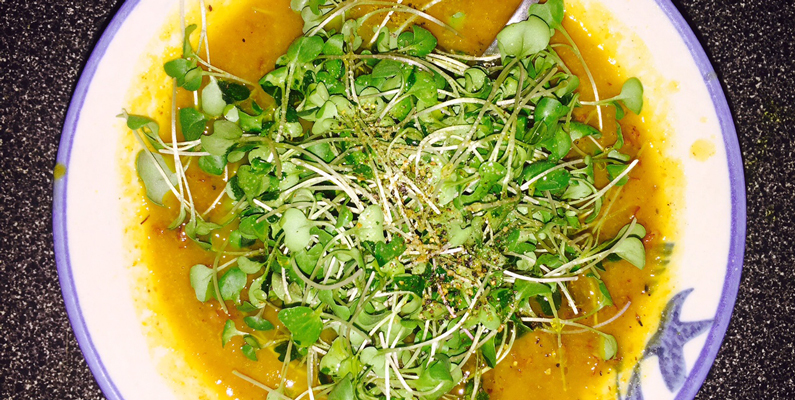 I like to top this with broccoli sprouts or any greens, drizzle with olive oil and serve.